Lock in a great price for Hilton Garden Inn Evanston – rated 8.5 by recent guests! Closeness to Northwestern’s campus and the train stop and the convenient parking made for a great visit. We stayed at this Hilton when we were doing a college visit of Northwestern. It was a great location for our needs. I enjoyed the breakfast. The hotel, service, staff, and comfort of the room were all great. My wife and I work in the area and just wanted a night away . It was a very nice overnight stay. The hotel itself is nicely decorated, clean- and our king room was very comfortable-so all in all a good experience. We would recommend. Breakfast offered many choices and was delicious. My grandson really enjoyed the pool. The woman who check is in was so incredibly sweet and the property was very accomidating. Everything was great, including buffet breakfast, servers, desk staff, and all facilities. Pool was nice, the whole property was modern and clean and well-maintained. Nicely appointed rooms, comfortable beds, good restaurant, friendly and helpful staff. 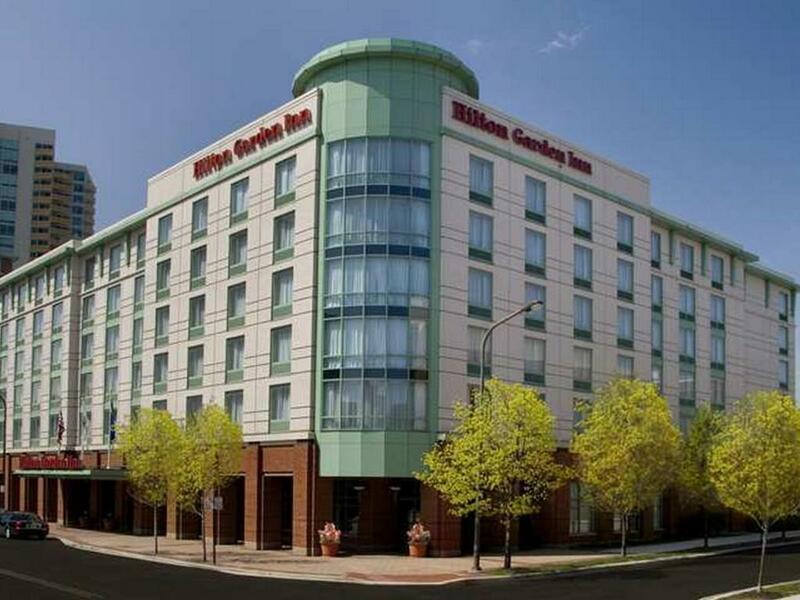 Hilton Garden Inn Evanston This rating is a reflection of how the property compares to the industry standard when it comes to price, facilities and services available. It's based on a self-evaluation by the property. Use this rating to help choose your stay! Situated adjacent to the campus of Northwestern University, this Evanston hotel features spacious accommodations, friendly service, and is only a short walk from beautiful Lake Michigan. The Hilton Garden Inn Evanston is ideally located within walking distance of beautiful beaches, parks and restaurants. The commuter rail system providing access to downtown Chicago as well as O'Hare International Airport is also a short stroll away. The Evanston Hilton Garden provides guests with many free amenities, including wireless internet access and in-room microwaves and refrigerators. Guests can also take advantage of the on-site restaurant and convenience store as well as the spacious indoor swimming pool. When would you like to stay at Hilton Garden Inn Evanston? This room has free Wi-Fi and cable TV. A microwave and a fridge are furnished. Public parking is available on site (reservation is not needed) and costs USD 16 per hour. This room has free Wi-Fi, cable TV, a sofa bed, and accessible bathroom. Has a microwave and fridge. Also has free Wi-Fi and cable TV. Includes free Wi-Fi, cable TV, and an accessible bathroom. Includes a king bed and sofa bed, microwave, fridge, free Wi-Fi and cable TV. Free Wi-Fi and cable TV are available in this room, along with a sofa bed, microwave, and fridge. This handicap-accessible room includes a TV with cable channels and a sofa bed. House Rules Hilton Garden Inn Evanston takes special requests – add in the next step! Hilton Garden Inn Evanston accepts these cards and reserves the right to temporarily hold an amount prior to arrival. very spacious room, excellent location. I had 4 people in the room and we only had 1 king size bed. Initially they were going to charge extra for a rollaway. They did give us one for free, but only after complaint. The elevator was broken always afraid we would get stuck on it. The pool was under construction. It was $16/day for parking and inwas charged $50 extra for incidintals??? Having to pay $15 for parking-no choice! We booked this hotel because Hilton is the name you know and trust. We came for a good time swimming and fun. With that being said the swimming pool was closed and when I mentioned there was noting in the booking information that said that and we booked at this hotel for the indoor pool. The front desk clerk rudely said “well do you still want to stay here”. I can’t remember her name it started with an A. Since we were already at the hotel we checked in. There were things not mentioned when booking the room. For example $50 incidental fee, $16 for parking in a garage not attached to the building. Not impressed with the room. I’ve stayed Motel 6’s that we’re better. We will not be returning. Connections to/from ORD is always a problem from Evanston. We couldn't seem to get towels at the swimming pool. Took forever for them to bring some. Although the hotel can be expensive, it is priced for the demanding North Shore market. TV outage. Front desk explained it was because of installing newer larger TVs and maintenance was working on it. She did accommodate for the outage which was reasonable and to our satisfaction. Checkout staff wasn't able to provide an invoice.... had to email and communicate additionally to eventually receive the invoice.